As Houston begins to recover from Harvey, a growing chorus of voices is calling for big policy changes to reduce flood damage from future disasters. Local officials haven't said much about what they might pursue, but history offers some clues. A growing chorus of voices — from scientists to some government officials to members of the public — say big policy changes need to be made in the Houston region after Hurricane Harvey dumped a record amount of rain there and swamped thousands of homes. But the Bayou City has been here before. The worst rainstorm to befall an American city in modern history before Harvey was Tropical Storm Allison, which dumped more than 40 inches of rain on Houston in five days, flooding 73,000 residences and 95,000 vehicles. Allison caused $5 billion in damage to Harris County alone — and Harvey's cost is expected to soar well past that level. Just months after Allison, Harris County began to pay people to leave their homes, ultimately spending hundreds of millions of dollars of mostly federal money. The county targeted thousands of families who suffered flood damage and lived in 100-year floodplains — areas with at least a 1 percent chance of flooding in a given year. The idea was that it would be cheaper to pay residents to live elsewhere than to constantly pay out flood insurance claims. Experts say the program was a good one but didn’t go far enough. Since Allison, the county’s flood control district has purchased about 2,400 homes, but a recent study said that at least 3,300 more should be targeted for immediate buyouts. Even if those homes were bought out, that still leaves tens of thousands in the 100-year floodplain. Local officials will surely ask for more money to buy out homes after Harvey. But they’ll have to depend largely on the generosity of Congress — and if they get more money, they’ll have to convince many Houstonians who haven't been willing to take the money and move after previous floods. The Harris County Flood Control District has already started asking homeowners whether they're interested in buyouts post-Harvey, though no money is available yet. "Buyouts are on the table ... voluntary and involuntary," said Harris County Judge Ed Emmett. "That's got to be an option." Harris County devoted tens of millions of federal dollars after Tropical Storm Allison to re-map its floodplains. The process took a lot longer than expected and resulted in numerous lawsuits. But experts say the redrawn maps still don’t reflect the true floodplains. That’s partly because the flood maps don’t account for what climate scientists say is an increase in the number and frequency of massive rainfall events. Harris County is in the middle of a large study that could result in updating some of those rainfall expectations. There may be calls to re-map floodplains again after Harvey. But if Texas officials secure the money to do it, it would take years. Meanwhile, experts also say the whole concept of the 100-year floodplain is becoming less and less useful. During Tropical Storm Allison, more than half the homes that flooded were outside the 100-year floodplain; that didn’t change during subsequent floods even after the maps were updated. As part of a broad effort to revisit development policies after the devastation of Tropical Storm Allison, in 2006 the city of Houston tried to restrict building in the “floodway” — an area within the floodplain that is at particular risk of being damaged by flooding because it’s directly in the central current of floodwaters. It seemed like a no-brainer to many at the time. 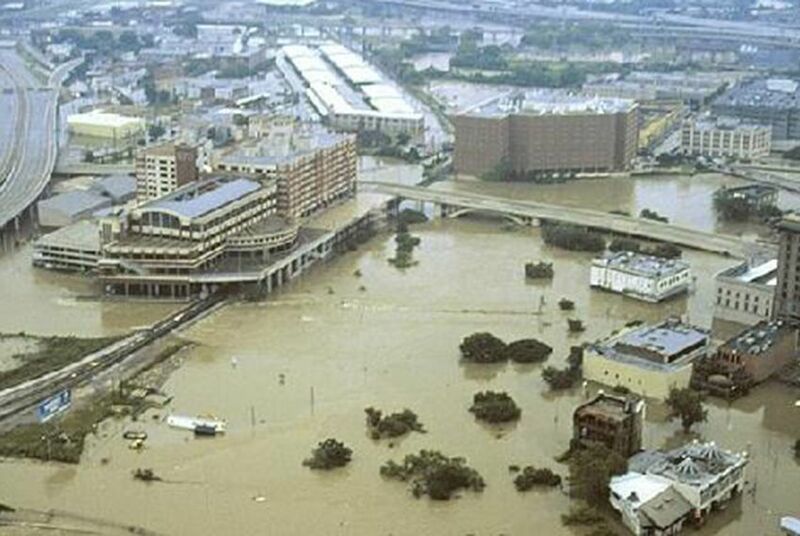 Since the mid-1960s — well before people fully understood what floodplains were — a Houston ordinance had technically forbidden building in a floodway. But the policy was riddled with exceptions that led to thousands of dwellings being built in floodways. Five years after Allison, the city decided to get rid of those exceptions. The result was a political catastrophe. As the floodplain maps were redrawn after Allison, hundreds of new properties were suddenly included in the floodway. That meant their owners could no longer renovate them or build anything new. Property values dropped instantly. A series of lawsuits and a political firestorm pressured the Houston City Council into severely weakening the restrictions two years later. Today, some members of the public and scientists are mystified that it is still possible to build in the floodway in the city of Houston. But many people who strongly opposed the floodway ordinance are still influential in Houston. For instance, Paul Bettencourt — now a Republican state senator — was tax assessor for Harris County when the floodway ordinance was adopted. At the time he bitterly complained that the policy would cost the area millions in tax revenue. And Adrian Garcia, then a city councilman who would later serve as Harris County sheriff, represented many residents who lived in floodways. After Allison, federal disaster relief money helped accelerate projects the county was already working on, such as upgrading the infrastructure around the bayous that carry floodwater through and away from Houston. Hundreds of millions of federal and local dollars have already been spent, and Harvey may help secure more money needed to finish these projects. But many of the bayou upgrades have taken years longer than anticipated, and the damage from Harvey might set them even farther back. Meanwhile, none of this work would prevent flooding from a massive event like Harvey. Flood control officials say the upgrades wouldn’t even protect homes from events on a much smaller scale than Harvey, like the 2016 Tax Day floods. Harvey has widely been referred to as at least a 500-year flood — a disaster with just a .2 percent chance of occurring in any given year. Flood control officials say protecting neighborhoods surrounding all of Harris County's bayous from just a 100-year flood would cost $25 billion. Currently, the county has been spending about $80 million a year on these upgrades. At that rate it would take 400 years to get the job done. Harvey relief dollars may increase that level of spending, but it’s still an daunting task. On top of public works projects around bayous, the region has also tried to improve its dismal drainage system. Former Mayor Annise Parker’s "Rebuild Houston" initiative, an $8 billion program approved by Houston voters in 2010, called for a dedicated drainage fee to address the problem. But the fee and the program have been beset with controversy and lawsuits. Bettencourt, the Republican state senator, said he led opposition to Rebuild Houston because many of its initial promises were abandoned. He added that much of the money being collected in drainage fees is not actually being used for drainage.